My recent two hitting sessions were against a heavy, cold wind. I was quite pleased with how the frame held up against the wind. 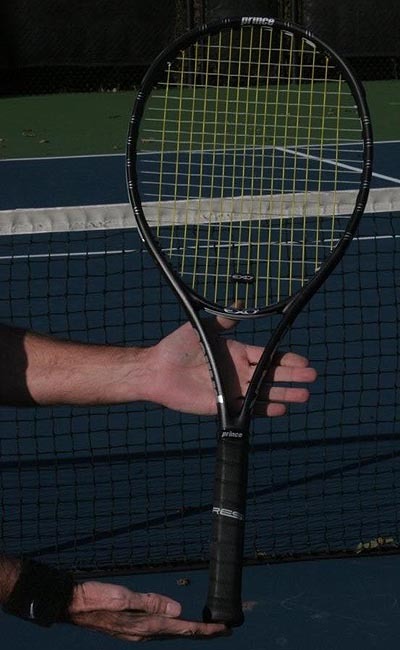 Here are some pics of the racquet, courtesy of Tom Coyle (Hilton D/FW Lakes). 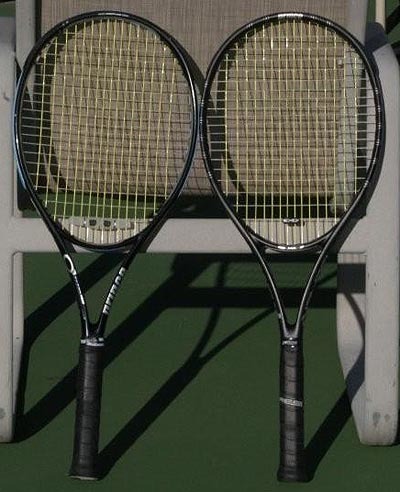 The EXO3 Black is shown by itself and compared right next to the O3 Speedport Black (both with the exact same string job). EXO3 Black is on the right, Speedport Black on the left (with the blue grommets). I have to keep the pic sizes small for the blog. Contact me if you want the full-size images. 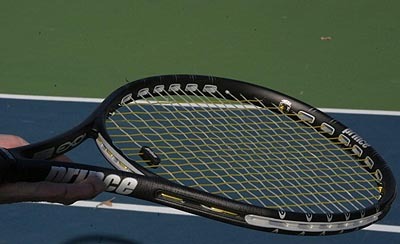 The racquet has the same 16×19 string pattern and head size as the O3 Black. Now, here’s the frame straight on. And last, the two side-by-side. BTW, the EXO3 Black is shown with the stock grip; the O3 Speedport Black has an overgrip. Sorry about the left hand over part of both frames, but it was *very* windy when these pics were taken, so it was pretty difficult to keep the two racquets steady for the camera. This is the first in a multi-part review of the Prince EXO3 Black. I’ve hit with this racquet four times with my standard stringbed of Pro Hurricane Tour 17 on the mains and VS Team Gut 17 on the crosses. I previously used an O3 Speedport Black, although have been hitting with the Black Team for many months while recovering from an arm injury. I’m still not back to 100% on the arm/shoulder, so I feel this is a good condition to report on any wear/stress caused by the new frame. Strung balance appears to be a few points head-light. 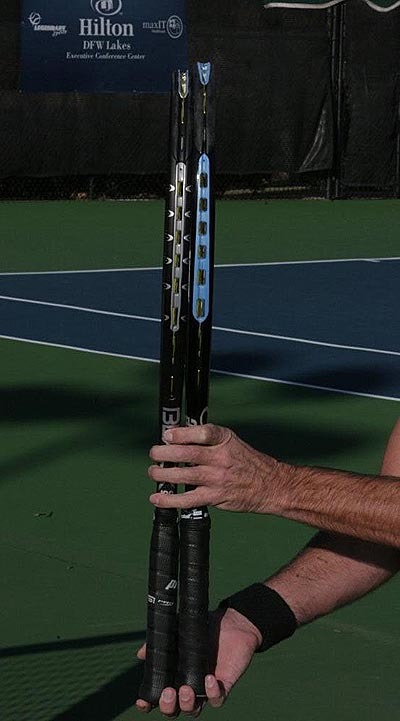 Although the EXO3 Black clearly feels heavier than the O3 Black Team, the swingweight is such that it’s pretty easy to get the racquet to the ball. I do experience some timing issues and that’s just a matter of me getting used to the frame. My style is all-court (1hb) and what I never do under any circumstances is stand several feet behind the baseline and trade mondo-topspin groundies with the young whippersnappers. I like to step up, take the ball on the rise, and hammer it back deep and hard. For that, you need a rock-solid frame and the EXO3 Black delivers with flying colors. I can’t describe how much I like the solid feel at impact. I can stand closer to the baseline and take half- or three-quarter swings at deep balls and pound them back with complete confidence. It was a bit hit-and-miss with the prior frame. Serves are a bit different. I’m taking more of a half-stroke motion, starting with the racquet raised in the air. The EXO3 Black needs a bit more work to generate the same service speed. However, I noticed that I hit my spots with more regularity. I suspect that the previous frame was more susceptible to slight twitches in forearm or wrist motion. I was quite pleased with the arm-friendliness of the heavier, stiffer frame. As expected, stroke timing is a bit different. When balls are being hammered to you by a pro or a 4.5+ player, tiny fractions of a second really matter. The first two sessions, I noticed some slight soreness in the front of my shoulder near the chest. It faded pretty quickly. By the fourth session, I didn’t notice much at all. With the Speedport Black Team, I had a problem with the head-heavy frame and a responsive stringbed at lower tension. Even sweet-spot impacts at very low racquet speed (like a drop shot) had some perceptible low-frequency vibration (the type a damper does not inhibit). Nothing but solid feel from the EXO3 Black. I should note, however, with this particular hybrid string job at lower tension, I prefer the feel of the frame with the small EXO3 vibration damper that comes with the racquet. Stock grip feels really good, although I’m not sweating much in the colder weather. For most racquets, I can’t wait to apply an overgrip. I’ll post another review as soon as I have pics. I don’t own a digital camera, so I have to find someone to take the pics for me. I want to compare the EXO3 Black to the Speedport Black in the same pic. Just returned from a long business trip. I’ve started a new and pretty intense gig. I’m back to work with the Flex framework for the first time in two years and already doing Google Finance-style data visualizations. I’ll be extremely busy for the next two weeks and then go on vacation for two weeks. I might blog a bit during vacation, but don’t expect much of anything between now and the end of the year.